Who Will Benefit From the “Louisiana Newspaper War”? 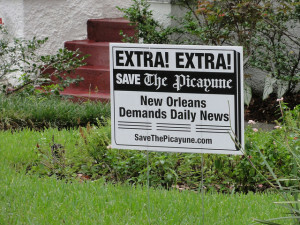 Although it’s been almost a year since The Times-Picayune started publishing three times a week, you can still see these signs on people’s front lawns in New Orleans. The (Some)Times-Picayune of New Orleans and its digital version, NOLA.com, were in the spotlight last week after their publisher NOLA Media Group announced the launch of a new tabloid that will fill the gap on the days the TP doesn’t publish. At the same time, The Advocate, a Baton Rouge daily, has been bought by a New Orleans businessman who apparently plans to grow the paper’s presence in New Orleans. As Gabmit Weekly‘s Kevin Allman, who’s been covering the TP-related developments in the past year, wrote on Monday, “And the Louisiana Newspaper War of 2013 began in earnest.” Question is, who will benefit? We certainly hope it’s the readers, many of whom still miss getting their beloved paper on their doorsteps every day. Here’s a short version of what’s happening. On April 30, Jim Amoss, editor and vice president of content at The Times-Picayune, announced the launch of a tabloid called TPStreet. It will start publishing this summer on Mondays, Tuesdays, and Thursdays, when TP doesn’t publish; will cost 75 cents (same as TP), and won’t be available for home delivery. The announcement drew a storm of comments, many of them negative, and some of which Amoss had personally responded to. Just to provide a small glimpse of the public reaction, here are three of the many similar comments on NOLA.com [emphasis ours throughout]. We are smarter than you give us credit for, and we will not be convinced that you are doing what is in the interest of this community. What was in the interest of this community was a daily newspaper which would be supported by a first class associated website. You gave us neither of those things, and now you are backtracking because your original plan to go digital did not work. We are insulted and we are going to support the competition. White flag has been raised. The digital experiment has failed. Perhaps if Nola.com had the look and feel of a newspaper (see New York Times and WSJ websites) it would [have] had a fighting chance. A blog with talking reporters does not make a newspaper. What a terrible marketing plan… TP seems to be willing to narrow their offering and then somehow make sense of charging more for it… The TP used to be a great publication and I hope it roars back, but charging premium prices for lesser product won’t make that happen. Open up the website to everyone and build your advertising to make profit on the paper product. If you can’t do that, then sell the damned thing and let someone who knows how make it work. While some national publications, when reacting to the news, are staying neutral, merely providing straightforward reporting of the news and refraining from any speculation beyond the “We’ll see,” the local journalistic coverage seems largely dismissive of the NOLA Media Group move yet hopeful of Georges taking over The Advocate and promising to give it a new look by September. When The Advocate’s new look debuts in September, that will mark 11 months since the Newhouses implemented their thrice-weekly strategy. The end of the noise that Steve Newhouse wished for never came, indeed the scene is about to get louder. While Georges praised The Advocate’s New Orleans edition, which was launched in the fall when The Times-Picayune decided to pare back to a three-day-a-week edition, he said there are ways to improve the publication and increase readership by tailoring the edition to New Orleans readers. According to Boone, the New Orleans area comprises roughly a fifth of The Advocate’s weekday circulation of 98,000, with Sunday circulation of about 125,000. Georges plans to double the number of the New Orleans subscribers. Georges, who called TP “wounded and confused” these days, also brought two former TP editors who were laid off during massive downsizing last summer, Dan Shea and Peter Kovacs, to The Advocate. Boone says Kovacs will be editor and Shea the chief operating officer and general manager, with “full authority” to implement any changes they see fit. [I]t throws another roadblock up for what I’ve argued is the Newhouses’ liquidation strategy in New Orleans, and the family has already squandered much of the enormous goodwill the Picayune had in New Orleans with their actions over the last year. The Advocate has a big built-in advantage in state politics and in LSU sports. It will also not have a hard time poaching talent from the Picayune and its layoff pool. The backdrop to all this is the dismal state of the newspaper industry. We’re all for healthy competition, particularly when it means more journalists on the streets and in the newsrooms. But a war of attrition that bleeds both owners would be the worst case scenario for New Orleans, a city that needs good journalism as much as any in the country. NOLA’s hamhanded PR not going to win back the trust of Picayune readers who have been so badly burned in the last year. The company controls one of the great brand names in American journalism in the Times-Picayune, and it goes and names something TPStreet. It will be interesting to see if maybe some laid-off TP journalists will end up at The Advocate, and whether TP’s still-loyal readers will benefit from any of this. Image by Editor B (Bart Everson).